"No Greater Gift Than Love "
In the animated fantasy adventure HOW TO TRAIN YOUR DRAGON: THE HIDDEN WORLD, new Viking chief Hiccup must find a legendary dragon world and defend both his people and their dragons from a villainous dragon-hunter. HOW TO TRAIN YOUR DRAGON: THE HIDDEN WORLD features the heart-pounding adventure and stunning visuals moviegoers have come to expect from this movie franchise, along with a wonderful story promoting selflessness, marriage, love, and family, but caution is advised for young children due to action violence and some light pagan, environmentalist elements. In this epic conclusion to the exciting animated trilogy of HOW TO TRAIN YOUR DRAGON films, Hiccup is now the chief of Berk, where Vikings and dragons live together peacefully. The arrival of a villainous dragon-hunter, Grimmel, sends Hiccup and his girlfriend, Astrid, on a quest to find a fabled hidden world of dragons, which may provide safe harbor for them all. They discover a female “Light Fury” dragon that corresponds to Hiccup’s Night Fury dragon, Toothless, who tries to court the new dragon. Eventually, Hiccup faces his hardest test yet in his determination to protect his people and the dragons. HOW TO TRAIN YOUR DRAGON: THE HIDDEN WORLD is a great example of how to make a family movie that appeals to children and adults. The movie’s animated fantasy world of Vikings and dragons is stunning and detailed, the action scenes are exhilarating, the story is moving, and the characters have gone on a real journey since the original movie in 2010. That said, the new movie works just as well as a standalone story for those who haven’t seen the previous two movies. The story has wonderful Christian elements. A key theme is that Hiccup can only mature and become the leader he needs to be by demonstrating sacrificial love. In a flashback, Hiccup’s father instructs him in words that sound biblical: “With love comes loss, but in the end it is worth it. There is no greater gift than love.” Hiccup is supported and encouraged by two remarkable women, his mother, Valka, and his girlfriend, Astrid. These two characters are very well done, exhibiting biblical feminine qualities of strength, wisdom and dignity. (A comical subplot is the courtship of the widowed Valka by two suitors.) Though one of the trilogy’s comic characters was supposedly “outed” as homosexual in the last movie due to an oblique, unscripted line of dialogue, no reference is made to this in THE HIDDEN WORLD. Ultimately, the third movie’s conclusion gives moviegoers a beautiful vision of a traditional family. That vision will have far more impact on viewers. Villain practices deceit, traps dragons and kidnaps humans. 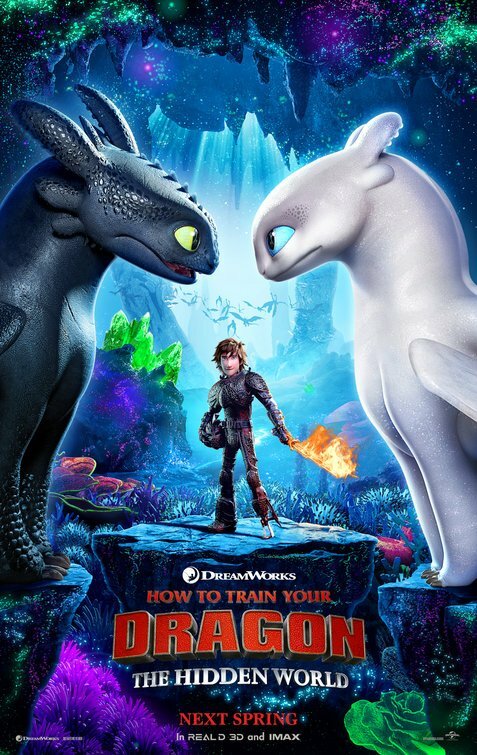 HOW TO TRAIN YOUR DRAGON: THE HIDDEN WORLD is the epic conclusion to the popular animated franchise about Vikings and dragons. Hiccup is now chief of Berk and must undertake a desperate quest to find a legendary land of dragons before a villainous dragon-hunter finds it. Hiccup’s love for his dragon, Toothless, and his confidence in his own leadership are tested to the max as he makes hard choices to defend the people and the dragons of Berk. HOW TO TRAIN YOUR DRAGON: THE HIDDEN WORLD features the heart-pounding adventure and stunning visuals moviegoers have come to expect. They’re combined with a wonderful story promoting selflessness, friendship, sacrifice, leadership, marriage, and family. A key redemptive theme is that Hiccup can only mature and become the leader he needs to be by demonstrating sacrificial love. HOW TO TRAIN YOUR DRAGON: THE HIDDEN WORLD has some action violence, but the filmmakers have taken the scary content down a notch from the last movie. THE HIDDEN WORLD also has some light pagan and environmentalist elements, plus some light crass humor, common to this film trilogy.